This shed-roof birdhouse is sized for small birds such as wrens chickadees and bluebirds. This shed-roof birdhouse, sized for small birds such as wrens, chickadees, and bluebirds, incorporates bird-friendly characteristics: the deep overhang, perchless entry, openings for air circulation, and easy access to the interior for cleaning. It’s built from rough-sawn redwood, but you can substitute other woods. The birdhouse is based on a design from Howard Rathlesberger, a member of the California Bluebird Recovery Program: CBRP, 2021 Ptarmigan Dr., Suite 1, Walnut Creek, CA 94595. The rough-sawn lumber we used was ⅞ inch thick. The width was 5⅞ inches for the 1-by-6 and 7⅞ inches for the 1-by-8. Check the dimensions of your lumber, since it could affect the size of the door and floor pieces. 1. Cut boards to the sizes shown in plan. Trim corners off floor piece (for ventilation). 2. Stand the side pieces on their 12-inch-long edges, overlay the back flush to the outside and bottom edges of the sides, and secure it with three woodscrews per side. Note: The tips of the angled sides should extend ¼ inch above the back to create an air-circulation gap when the roof is added. 3. Position the floor piece between the sides 2 inches from the bottom, and secure to the sides and back, using one screw for each board. 4. On each side piece, mark a point that is 1 inch up from the bottom and ⅜ inch in from the front edge. Drill a ⅛-inch hole through each side at this point, insert the front piece between them, and run a screw through each hole into one edge of the front. Check that the front pivots easily on the screws; it will be the door. 5. Position the top so it overhangs the back about ½ inch and the sides evenly. Check that the door clears the overhanging roof. Remove the door and roof. 6. Center and drill a 1¼-inch-diameter hole in the door so the center of the hole is 2 inches from the top of the door. On the inside face of the door, cut ⅛-inch-deep horizontal grooves at ½-inch intervals between the hole and the floor piece (see photo above right). These will serve as a climbing ladder for young birds. 7. Cut a similar shallow groove ¼ inch from the front on the underside of the roof piece. (It serves as a drip edge.) Replace the door and secure roof with four screws. 8. Finally, drill a hole for an eightpenny nail at a downward angle through each side and into the edge of the door. The holes should be slightly wider than the nails, so the nails can be removed easily to open the door for nest cleaning. Embellish as you see fit. Secure the house to the trunk of a tree or a post or, adding eye screws to the roof, hang it from branches. Not all birds will nest in birdhouses, but those that do aren’t very fussy about aesthetics. What they do care about is safety and proper size. Here are some rules of thumb ― er, wing. • Use the appropriate configuration and the right size of hole for the particular species you wish to attract. 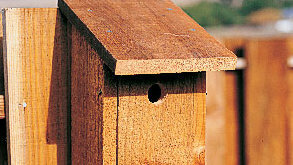 • Make birdhouses openable for periodic cleaning or monitoring. • Provide air circulation and drainage. • Build with wood ― for its insulation qualities and ease of construction. • Select natural or muted colors ― bright colors can attract predators. Don’t paint interiors of houses. • Add a textured surface on the interior wall below the entry to allow hatchlings to climb to the hole. • Angle the roof and extend it well beyond the entry, both for drainage and to discourage predators. 1. Leaf shapes carved in blue-stained sides and painted. 2. Slender wood strips for a board- and-batten effect, with thick shingle roof. 3. Layers of eucalyptus bark nailed and glued in place. 5. Diagonal lattice over brown-painted shell. 6. Glycerin-dried oak leaves attached to house with a glue gun.